Our article, “Realizing the Focus of the Discipline: Facilitating Humanization in PhD Education” began as an assignment in our nursing theory class. When Dr. Perry asked our cohort of four to “apply a nursing theoretical lens to nature and health” never in our wildest dreams could we anticipate that the assignment would lead to this article. Each of us was still learning what it meant to be a doctoral student, all while balancing careers and families. Being in a graduate school as a wife and a mother of three young children is very challenging and stressful in all possible senses – physically, emotionally, and psychologically. The guilt of not being there for my children and countless occasions of delegating parent conferences and my kids’ games and performances to my husband become overwhelming sometimes. Studies evince a significant negative relationship between work-family conflict and life satisfaction, work satisfaction, and family satisfaction. As interpersonal support from family increases, perceived stress in graduate education decreases as noted by Iniki (2018). This scholarly work undertaken with my colleagues that yielded this publication brought the assertions above into reality for me as a beneficiary with my first-grade daughter as the supporting agent to mitigate stress. The choice of including my child in this project was pricelessly meaningful to both of us. I remember how my daughter’s eyes widened with gleam and excitement the day I invited her to help my classmates and me do a project. Her anthem to siblings and friends through the week was, “I’m helping my mom and friends in their school project!” My personal interpretation of those words of hers is, “My mom’s schooling is not depriving me of her after all; I could still have fun with her even when she’s doing schoolwork!” To this day, Yiedie and I still reminisce on our experience on the trip to take pictures for this project. The lovely memories of the day are etched in our hearts. As we worked together creating the book, we realized how transformative this assignment had been. By applying nursing theory in general, and the unifying focus specifically, we came to understand nursing theory and knowledge not as a static framework but as a reciprocal guide that is generated from experience and in turn guides practice. More importantly, we experienced humanization and improved quality of life. It is quite possible the renewal that came from this assignment carried us through the remainder of the year! We hope this article spurs faculty and students to consider ways to apply nursing theory in a way that is meaningful to them. We truly believe that theory guided practice comes from knowing and embracing theory in a practical and personally relevant way. Finally, we applied the principles of the unifying focus to public health. In the future we plan to further disseminate the book to encourage children to enjoy the wonders of nature. We hope that nurses in all role groups and settings can consider how they can apply the concepts of humanization, meaning, choice, quality of life and health to their practices; for it is through these concepts that we differentiate our practice from those of other health disciplines. When Danielle Leone-Sheehan and I wrote this paper, it came from our collaborative engagement in living nursing theory and caring. Our experiences as n: urses and human beings compelled us to write about that which was special to us within the unitary field. As nurses grounded in nursing disciplinary knowledge and deeply appreciative of the view of life’s unfoldment afforded from within nursing’s unitary-transformative paradigm, we felt it important to explicate spiritual knowing as another pattern of knowing in nursing. In a sense, we wanted to act as ‘illuminators of spiritual knowing’ drawing upon wisdom deep within ourselves that reflected our experiences as healers and teachers oriented towards all that is good, wholesome, and healing in being human. In our collective experiences across multiple dimensions of our lives as private citizens as well as in our nursing research, clinical nursing experiences, and teaching-learning-mentoring work with students, we’ve experienced the value of being the recipient of and holding-for-others this expanded spiritual consciousness of compassion, peace, patience, kindness, and gentleness. We’ve known the power of spiritual knowing when discerning meaning or finding strength within difficult situations. We’ve felt compelled to claim and lift up that which is spiritual and central in the work of healing, caring, and humanization in its fullest sense. This journey into the land of spiritual knowing has been inspiring. We look forward to the evolution of our expanded unitary spiritual knowing as the years unfold ahead. As we were planning this paper, our common insight was that spiritual knowing is real; yet, spiritual knowing has not been named, lifted up, privileged, and talked about within the wide world of nursing. This insight energized us to change this unfortunate reality. We named spiritual knowing as a unitary-transformative pattern of knowing the world. And, as we often reflect, once you’ve experienced spiritual knowing there’s nothing quite like it. There is a feeling of alignment with a universal world of goodness without boundaries. Spiritual knowing is pan-dimensional and healing. It uplifts one’s consciousness into a more expansive unitary thought model than is possible without it. Spiritual knowing is important to human wellbeing such that nurses need to engage in further research/study about this pattern of knowing particularly with relevance to how nursing and caring grounded in spiritual consciousness influences nursing-sensitive caring outcomes and human wellbeing. We wrote this paper to strongly advocate for spiritual knowing and to intentionally focus our work as caring healers on spiritual qualities that uplift humankind. It has been our experience that human beings typically do well with lovingkindness, compassion, forgiveness, peacefulness, and experiencing self-other and living-dying within a larger framework of meaning and purpose. We are pleased that we have named and claimed spiritual knowing as a pattern of knowing for the discipline and profession of nursing on behalf of those we serve. We hope other nurses will find our writings valuable contributions to the ongoing evolution of nursing. Opening and Welcoming All – Come walk with us on this inspiring and expanding unitary-transformative journey. 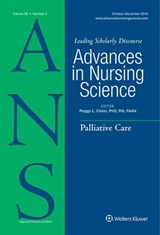 The current featured article is authored by Mary Jane Smith, PhD, RN, FAAN and Joyce J. Fitzpatrick, PhD, MBA, RN, FAAN, titled “Perspectives on the Unitary Transformative PersonEnvironment-Health Process for the Knowledge Base of Nursing” . This article, along with others in the current ANS issue, will form a basis for discussion at a conference to be held March 20-21st at Case Western Reserve University Frances Payne Bolton School of Nursing. The conference will be focused on exploring the knowledge base for nursing, and will commemorate the first nursing theory conferences held in 1967, 68 and 69. The theme of the conference is “Nursing Theory: A 50 Year Perspective, Past and Future” At the conference, participants will be doing exactly what the title of this post calls for – exploring the knowledge base of nursing. In this current featured article, the authors focus on a unitary-transformative perspective – one of a number of perspectives that contribute to the development of knowledge that informs and shapes nursing practice. Download your copy of this article while it is featured – and come back here to share your comments and reflections! As I look back on the last 50 years of progress in nursing knowledge (Roy, 2018) I feel a great sense of pride in accomplishments of setting a firm foundation for the discipline of nursing and the practice of nursing as a profession. Still, I feel challenged by a call to nurses to move forward in building on the advances in defining nursing to create a structure for knowledge for practice that accounts for our developments and those of all the sciences. This structure gives a central place to all levels of nursing theory. In this article, I present a full picture of nursing knowledge development as domain-derived and practice shaped. The figure (Figure 1 below) includes philosophical beliefs and values and has at the center, the goal of nursing. I really feel, as did Dorothy Johnson 50 years ago (Johnson, 1968) that a clear goal for nursing is the basis for developing knowledge. I selected the goals of facilitating humanization, meaning, choice, quality of Life, healing in living and dying from a publication on a central unifying focus for the discipline (Willis, et al. 2008) that has received attention in the literature in the years since. The right side of the figure proposes that nurses use all other scientific developments, including genomics by shaping them for practice. Nurses will contribute to this knowledge in other disciplines by asking practice relevant questions. However, the major efforts of nurse scholars will be to focus on domain-derived knowledge using all forms of inquiry. In my view, the contribution of this article is the domain-nursing knowledge tree (see Figure 2 below). I am proposing that based on the over-all goals of nursing, each nursing grand theory has a way of contributing to these goals. Each grand theory then is the basis for a number of model range theories that give rise to practice theories. This approach is open to controversy. I ask PhD students to consider the advantages of all theories aimed at common goals of nursing. Secondly, what do they think might be barriers to all theories aimed at common goals? Every reader will have opinions on these and other questions. Still at this stage of my work, I feel called to put forth this possibility. I would love to see how this approach might turn out. I will also enjoy whatever happens by just putting the ideas forward. Johnson, D. E. (1968). Theory in nursing: Borrowed and unique. Nursing Research, 17, 206-209. Roy, S. C. (2018). Key issues in nursing theory: Historical developments and future directions. Nursing Research. Special Focus Issue on Theory and theorizing in nursing science. 67 (2). 81-92. The current featured article in ANS 42:1 is by Pamela G. Reed, PhD, RN, FAAN title “Intermodernism: A Philosophical Perspective for Development of Scientific Nursing Theory.” This article will also serve as a focus of discussion at a conference that will convene at Case Western Reserve University March 21-22 in Cleveland, OH, celebrating the 50th year since the first conferences focused on the disciplinary perspective of nursing, and the structure of nursing knowledge. Dr. Reed’s article will serve as a focus for discussion and debate for years to come, prompting advances in nursing knowledge development in the years ahead. Her aritcle is available to download at no cost while it is featured, and we welcome your comments here! Dr. Reed sent this message about her work. I am SO pleased to have this paper published in Advances in Nursing Science! It was in this same journal where in 1995 I published a treatise that introduced some initial ideas about a philosophy of nursing science, which I then labeled neomodernism. This current paper is the outcome of my continued work (and passion) in philosophy of science as it relates to knowledge and theory development in our discipline. In developing this philosophical perspective, I was particularly interested in bringing together the foundational focuses of nursing knowledge with the creative and scholarly ways that nurses practice their profession and science. I drew from philosophical worldviews within and outside of nursing, and from philosophies of science more formally. I also thought it important to provide (for readers and me!) some historical perspective on philosophies of science and theory structure, as background for a philosophical view I am proposing for nursing’s present and future. Whereas I initially called this view neomodernism, I came to the decision that intermodernism better represented the post-postmodern philosophy that it is – one that incorporates both modern and postmodern ideas. I wanted to articulate a philosophical view that is meaningful to nursing and is also pluralist yet internally consistent. Accomplishing all of this will likely involve continued work and dialogue! In the meantime, I hope it can be useful among nursing students as they hone their research questions, and among nursing scholars and maybe also other health science scholars as they formulate new directions for research and practice. Mostly I am hoping that this article generates discussion among nurses about the role of theory in building nursing knowledge – about new strategies for theory development that integrate practice and science more deliberately, and about expanding perspectives of our familiar ‘nursing theory’ to make it the central cog in the wheel of nursing inquiry into processes or mechanisms underlying human health and well-being. This paper addresses a topic that has generated debate within the discipline of nursing for at least 50 years, just a little longer than I’ve been a nurse. Even when I was younger, or newer in my career, I was in search of the answer to the questions, “What differentiates nursing from other disciplines?” “What is unique about what we study and what we offer to society?” “I’ve tackled that question and have answered it for myself, by stating that it is the study of human-environment health and healing through caring, and that through a caring relationship nurses promote health and healing of whole persons within their relevant environment (physical, social, political, economic)”. Some may argue that this question is settled, but I disagree. There are many troubling signs, “existential threats”, that tell me that these questions and answers are as important as they were 50 years ago. I’ve described some of them in this paper. In my experience nurse researchers, scholars and practitioners are not at all clear about the nature of the focus of the discipline. I’ve taught undergraduate and graduate nursing students for over 40 years. In many of my classes I introduced the question, “What is the focus of the discipline of nursing?” The responses are often related to what nurses do in practice, or that “we coordinate the activities of all the health professions”. As we dug deeper they discover how defining nursing by what nurses do has left us vulnerable to others who have carved out a practice grounded in specialized knowledge related to their phenomena of concern. By defining nursing as a verb (what we do) without considering nursing as a noun (what we know and study) has strengthened the claims that registered and advanced practice nurses are assistants, coordinators, team members, and technicians. I can’t tell you how many “A-Ha” moments I’ve witnessed after this discussion as students come to the epiphany that being clear about the focus of our discipline matters. But, this isn’t about staking a claim for the discipline of nursing and defending it for our own sake. It is about valuing nursing knowledge and the difference it makes to those we serve. Nursing knowledge is needed for the well-being of humankind. When we conduct research contributing to the knowledge of medicine, psychology or sociology, or practice from the perspective of other disciplines, society suffers. I do believe that nursing’s disciplinary perspective and the knowledge and practice that evolves from it is the “secret sauce” often missing in healthcare today. People need what we offer when nursing is studied and practiced from our disciplinary perspective. I approached this article through analyzing the literature on the discipline of nursing to arrive at themes. These themes could guide us in the differentiation of the professional discipline of nursing. They might be a touchstone for those practitioners, educators and researchers as they ask, “How does my practice, curriculum or research align with the focus of the discipline of nursing?” I offer examples of areas of inquiry that would be aligned with the nursing knowledge. I hope this article generates some lively discussion that regenerates the interest in and focus on nursing knowledge. My hope is that while it may not be new, revisiting it may spark new understandings. It reminds me of T.S. Eliot’s words, “We shall not cease from exploration, and the end of all our exploring will be to arrive where we started and know the place for the first time”. I have been conducting research related to Watson’s Caring Science for many years. I teach online nursing courses and so a lot of my work explores caring in online settings. I also teach a Caring Science, Mindful Practice Massive Open Online Course where I regularly interact with people all over the world who are interested in learning about caring and sharing their own caring experiences. So far, almost 4000 people (and counting) have registered for this course, and about 25% of them are not in healthcare or (specifically) nursing. Despite not being nurses and knowing nothing about Watson’s Human Caring Theory when the signed up for the course, my non-nurse learners have responded with enthusiasm, wisdom, and deep understanding as they have progressed through the course. It became apparent to me that Watson’s Caring Science resonated with nurses and non-nurses alike, so I set out to conduct structured research to explore this more fully. This article is the result of my inquiry around this interesting observation. Currently there is a paucity of research related to applicability of nursing theory outside of the nursing discipline. It is unknown from a formal, academic standpoint, whether Watson’s Caring Science would be considered applicable outside of the nursing discipline and I believe the results that appear in this article provide validation regarding applicability of caring science across disciplines. More research is certainly needed, but this is a good start. This type of research is important because of the current focus in increasing interdisciplinarity in healthcare and beyond, and I believe that establishing/identifying a shared frame of reference (i.e. principles related to Caring Science) will help people create and maintain productive interdisciplinary collaborations and relationships. Exploration and recognition of basic shared core caring values (i.e. who we “are” as opposed to what we “do”), coupled with shared exploration of trim activities (i.e. varied tasks and job roles that all of us “do” every day), will create common ground upon which to build working relationships with a focus on caring rather than doing. And caring rather doing is a useful approach in nursing, healthcare, and beyond. Transition Programs on Competency Development and Patient Safety: An Integrative Review” by Deborah E. Tyndall, PhD, RN; Gina C. Firnhaber, PhD, RN, MLS, MPH and Elaine S. Scott, PhD, RN, NE-BC, FNAP. I had the pleasure of speaking with the authors about their work, and in the video below share our very interesting and informative conversation about how they came to do this work, insights about their method, and the implications of their work for future scholarship in this area. Their article is available at no cost while it is featured – we welcome our comments and feedback below! My interest in New Graduate Nurse (NGN) transition stems from my experiences working with undergraduate nursing students and novice nurses in the first year of practice. For many years, I taught professional development classes to NGN. In one of these classes, Thriving in Your First Year of Nursing, I heard the successes and challenges that NGN face. These stories deeply impacted my understanding of the many factors that influence NGN transition to practice. with a multidisciplinary team. This team, led by Dr. Elaine Scott, was formed to advance nursing science by evaluating nurse’s contributions to: 1) patient safety, 2) organizational capacity-building, 3) organizational sustainability, and 4) economic benefit (POSE). Dr. Scott had been my dissertation chair and I was familiar with her work related to NGN transition to practice. Through her leadership, the team generated various grant projects. This article features our scholarly work from of those projects. Culturally-related beliefs about personal weight are thought to contribute to behaviors leading to the high prevalence of overweight and obesity among African American women. However, no tools existed that measured beliefs about personal weight among young African American women. This gap in the literature was addressed with the initial development and testing of the Beliefs about Personal Weight Survey. In our current study we report the revisions and psychometric evaluation of the revised Beliefs about Personal Weight Survey (BPWS-2) with a sample of young African American women. Our goal was to reduce and refine the original items to make the Survey more useful in clinical and research settings. Psychometric evaluation of the BPWS-2 showed that the four factors from the original BPWS reemerged (Weight Acceptance, Weight Concern, Conventional Weight Regulation, Circumstantial Weight Regulation) along with a fifth factor (Excess Weight Acknowledgement). This fifth factor represents a distinction between accepting personal weight as overweight verses acknowledging personal weight as excessive. This distinction was associated with specific eating behaviors. The five factors (subscales) were sensitive enough to determine unique eating behaviors and psychosocial factors that influence body mass index among young African American women. Findings from this study indicate that understanding beliefs about personal weight may be a critical component in developing effective weight management strategies. I am intimately familiar with cardiovascular disease, as many of us are. My personal and professional experiences with the devastating effects of heart disease prompted me to make significant dietary changes several years ago. While I have reaped immense health benefits from modifying my diet, it was not an easy transition. My experience caused me to see diet change through a different lens, becoming acutely aware of the challenges individuals face from a cultural perspective. While working on my doctoral studies, I began exploring diet change as a strategy to promote cardiovascular health. Much of my initial research left me pondering the connection between cultural influences and diet. I found myself using the words “dietary culture” often when describing obstacles to successful diet change. However, this concept was not clearly defined in the literature. I also received questions from others about how our culture could be a barrier to implementing a heart-healthy diet. My need for a clear definition and a more profound understanding of the concept lead me to conduct this analysis. The analysis process was invaluable to clarifying my understanding of dietary culture in relation to cardiovascular health. The proposed definition will be used to inform my future work, exploring the plant-based diet transition among adults with cardiovascular disease. Also, I hope that this concept analysis will promote an acknowledgment and understanding of the relationship between diet, culture, and cardiovascular health among nurses and other health care providers.